Walt was always interested in the "future just around the corner." When Disney's live-action feature film comedy Moon Pilot (based on the 1960 story, Starfire, by Robert Henry Buckner) was released February 9, 1962, U.S. audiences were not in the mood for a light-hearted look at the people behind America's space program bumbling manned space flight. The fabled Space Race between the Americans and the Russians at the time was deadly serious and many Americans were fearful. The Soviet cosmonaut Yuri Gagarin was launched into orbit around the Earth first on April 12, 1961. The capsule was operated on automatic mode, but the accomplishment shocked and embarrassed the United States. On May 5, 1961, Alan Shepard became the first American in space but did not achieve orbit. He was the first person in space to exercise manual control over many of the spacecraft's functions. The first Soviet cosmonaut to exercise manual control was Gherman Titov in August 1961. Roughly a year after the Soviets put a human in orbit, the Americas did so with astronaut John Glenn on February 20, 1962. When the Disney film was released, the conflict between the United States and the U.S.S.R. for supremacy in outer space made it extremely difficult for the Disney designers to get access to necessary information for their film. The blockhouse set was patterned as much as it could be on the real thing as well as a mixture of common sense and good design. Thanks to his connections and popularity, Walt Disney got to visit the Vandenburg Air Force Base to see the launching of an Atlas missile for himself during the early preparation for the film. Accompanying Walt was Imagineer Marvin Davis, who was the art director for the film, and they toured control rooms and other facilities, as well. Davis also mentioned to West that the most difficult item for him to create was the space capsule seen in the opening segment of the film because all such information was highly classified. The Air Force also furnished a technical director, made some stock footage available, provided air craft for a scene or two, and allowed some limited shooting on the base. When I gave a presentation on the Disney space programs for the Disney Family Museum, Walt's son-in-law Ron Miller, who was associate producer on the film, told me, "Walt really wanted to see something go up. We partied and drank too much with the generals and top brass the night before so it was difficult to get up in the morning for the launch but we did. "It was dark and foggy and we couldn't see anything," he said. "We heard an explosion and saw a burst of light in the gloom and that was it." Diane Disney Miller, who was with us, added, "Dad hated funerals. That was the same day as the funeral of his brother Herbert and I've often wondered if he scheduled that so he could avoid going to the funeral." Walt was always interested in the future "just around the corner." When Tomorrowland opened in July 1955, it was originally meant to represent the world of 1986, which was the next scheduled appearance of Halley's Comet. The icon for this themed area was the 80-foot tall Moonliner, the tallest structure in the entire park at the time. It was designed by Imagineer John Hench, who sought input from Dr. Werhner Von Braun, which accounts for its superficial resemblance to Von Braun's infamous V-2 missiles. Von Braun was one of the experts, along with Willy Ley and Heinz Haber, who consulted on three episodes about the future of space travel produced in the 1950s for the Disney weekly television show. The first episode was titled Man in Space and aired on March 9, 1955. It had cost approximately $250,000 to produce, an enormous amount of money for an hour-long television show with no chance to recoup its costs. It ended up that close to 42 million people watched the show, resulting in multiple reruns and a theatrical release as a documentary short subject. 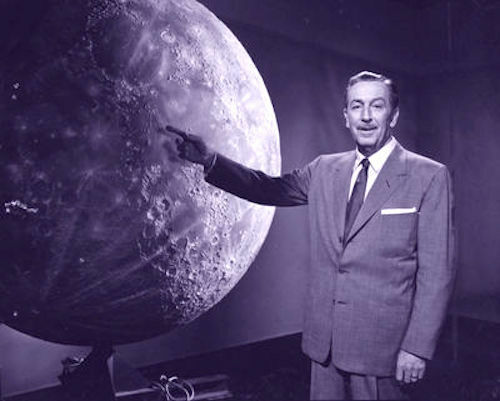 Walt said that the objective of the production was to combine "the tools of our trade with the knowledge of the scientists to give a factual picture of the latest plans for man's newest adventure. We want the public to know that these are not science fiction." In the 1950s, von Braun was justifiably frustrated at how passive the United States was at developing a space rocket program. Initially, the U.S. was only interested in rocketry as weapons. He believed he could transform the public's fascination with science fiction into an interest in science fact that might spark faster development of a space program. Remember, this was the era of UFO sightings and a flood of science fiction films preying on post-war paranoia. Collier's magazine (which had a weekly circulation of between three and four million readers) offered von Braun and other scientists like Haber and Ley an opportunity to write a series of "science factual" articles. When Disney director and producer Ward Kimball, who had read these articles and was developing the space shows for the Disneyland television series, contacted von Braun to perhaps act as a consultant, the scientist jumped at the chance because he realized that there were 15 million Americans with television sets. Like the Collier's articles he thought that this was a perfect opportunity to "sell" the average American on the exploration of space. "To make people believe that space flight was a possibility was his greatest accomplishment," said Mike Wright, staff historian for the Marshall Space Flight Center. "Von Braun brought all of this out of the realm of science fiction." When Man in Space was rerun just three months later from its first airing, supposedly President Eisenhower requested a copy of the television show to show the Pentagon. Shortly afterward in July, President Eisenhower announced that the United States would launch a small unmanned earth-circling satellite as part of the U.S. participation in the International Geophysical Year. Though Kimball frequently told this story (sometimes elaborating on the confusion at the Disney switchboard when the President's office called with operators thinking it was a prank by animators) and definitely corresponded with von Braun indicating that Disney was planning to publicize this involvement when the show was scheduled to be rerun again in September, it is important to remember that neither the Office of the Historian at the Pentagon nor the archivists at the Eisenhower Library have been able to locate documentation supporting Eisenhower's interest in the Disney film. That doesn't mean that Kimball's story is untrue. It only means that supporting documentation has been elusive. One thing that cannot be denied is the huge impact the three Disney space oriented shows (Man in Space, Man and the Moon, Mars and Beyond) had on public opinion which obviously influenced the acceleration of effort on the U.S. space program. The films also influenced many people who later became aerospace engineers and even top NASA officials and had a significant cultural impact on the American space program, especially when news articles half seriously suggested that the United States should turn over the space program to Disney since Disney had a plan and a vision. So it was not surprising when in 1965, exactly 10 years after Man in Space aired, von Braun once again found himself frustrated by the U.S. government's lack of enthusiasm about putting a man on the moon and, once again, he saw that the solution was to involve Walt Disney. Wernher von Braun wrote to Bill Bosche, a sketch artist and writer on the earlier Disney space films with whom von Braun had worked closely. It was Bosche who sent von Braun long lists of technical questions that needed to be answered in order to develop the storyboards for the show. Bosche was an artist, writer, and producer at Disney for more than thirty years and helped compile the film for The Walt Disney Story attraction. In the letter, von Braun invited Walt Disney and other key Disney personnel to tour the Marshall Space Flight Center in Huntsville, Alabama. 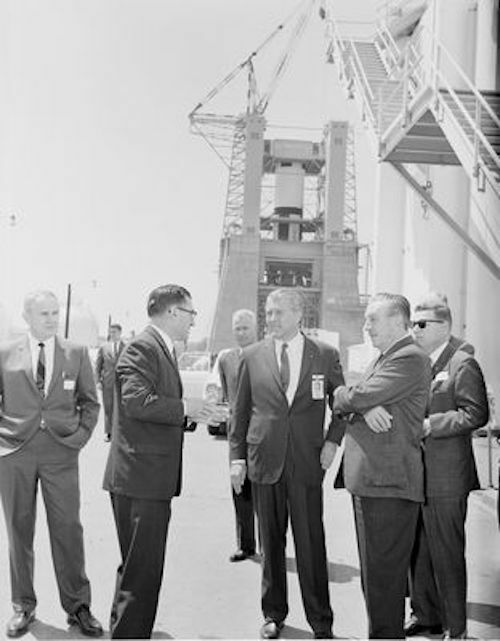 At the Marshall Space Flight Center in Huntsville, Alabama, Wernher Von Braun, center, and Walt as the S-1C stage is being installed in the background. "It is really only a few short years ago since I had the pleasure of working at your studios (on a project) which, it turns out was quite prophetic," wrote Dr. Von Braun who was now director of NASA's space flight center in Huntsville, Alabama. "I understand that over the years you have kept up a rather lively interest in the space program and, particularly, in manned space flight. For this reason, I thought you might like to have an opportunity to see just how prophetic (you were)." It was apparent that von Braun was hoping lightning would strike twice and that he could get Walt so excited about what they were doing that it might generate another series of Disney television programs to enthuse the public to actively support a more aggressive space program. Frank Williams, director of the Future Projects Office at the Marshall Space Flight Center, and a close associate of von Braun, wrote to Bart Slattery, director of the Public Affairs Office at the Marshall Space Flight Center, on November 13, 1964 that: "Out of this we would at least establish good will, and maybe (if we play our cards right) we could get something going that would be of tremendous benefit to MSFC, Apollo, NASA, and the entire space effort." In April 1965, Walt, accompanied by his brother, Roy, as well as several WED Enterprise personnel including, Bill Bosche, Ken Peterson, John Hench, Claude Coats, and Ken O'Connor, swung through the three chief space centers at Houston, Cape Kennedy and Huntsville, Alabama. Walt took time out between his looking around to fly a couple of simulators. His earth-bound flight missions were both accomplished at NASA's manned spacecraft center at Houston. There, Walt at the age of 63 "flew" a Gemini simulator to a successful space rendezvous or docking, then "landed" on the moon in a LEM (lunar excursion module) after two professional airplane pilots had well overshot the green-dot target area on a simulated moon. On the front page of the April 13, 1965 edition of The Huntsville Times with a headline proclaiming "Walt Disney Makes Pledge to Aid Space," Walt was quoted as saying "If I can help through my TV shows … to wake people up to the fact we've got to keep exploring, I'll do it." Von Braun's daily journal entry for April 13, 1965 indicated his hope that the tour "may easily result in a Disney picture about manned space flight." However, if von Braun was hoping that Walt would immediately put such a project into the works, he was sadly disappointed. Walt's attention was consumed with other projects. While Walt may have had an interest in space exploration, he was passionate about E.P.C.O.T., Cal Arts, Mineral King and a half dozen other projects that took precedence over developing another space series. In 1970 von Braun was removed as director and promoted to where he was no longer in a decision-making position. He continued to plan for a Mars mission but gave up and resigned in 1972 when it became apparent that none of his proposals received any sort of serious consideration. He took a private sector job, developing and deploying satellites for the Fairchild Corporation. He became seriously ill in 1975 and, on June 16, 1977, succumbed to cancer at age 65. Former Disney archivist Dave Smith discovered in the inactive story file a project titled "Man in Space, Then and Now." Smith interviewed Bosche about what happened to the project that was never made. "One of the reasons was that Von Braun became ill. And he visited us here. This was a project that I had started and Von Braun did visit us here at one time and we talked about it and the idea was to use footage and use Von Braun from the old show and some things that he had predicted then and how it had turned out and then let him make predictions for the future. "And because of other production commitments and things like that it just never really got off the ground. And it would have been a fairly expensive show. I still think it would have been fun to do." "I was completely thrilled with what we saw. Anyone would be thrilled if he could see the fantastic effort and organization that must go behind space flights like the one McDivitt and White completed so brilliantly on their history-making four day mission. It's hard to comprehend — unless you've seen some of it first hand, as we did just prior to the flight—to really understand the daring that necessarily goes into an effort such as this one." "The whole thing lies almost beyond the comprehension of the non-scientific mind. For instance, three hundred thousand people are needed to set up, check out and operate a space flight, staffing a network that covers most of the world. These NASA crews are not permitted a single mistake, of course. All mistakes must be made ahead of time. And then the entire performance must be carried out before the eyes and ears of billions of people, both friendly and the unfriendly. Any American would be—should be—proud that all of us are in some way part of our country's efforts in tackling this fabulous new space frontier."